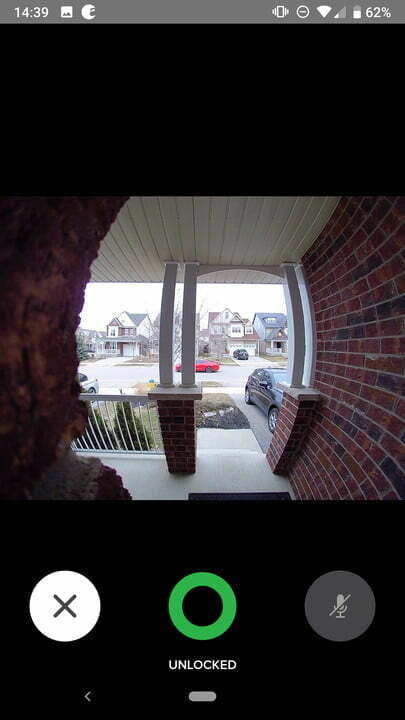 August’s View video doorbell adds simplicity and a pop of color (if you want it) to your front door. When Yale snapped up August Home last year, we were worried that the smart home pioneer would be subsumed into the giant security conglomerate and the brand could disappear from view. With the launch of the August View Smart Doorbell ($230), it’s clear that’s not going to be the case. Of course, this is not the company’s first doorbell. 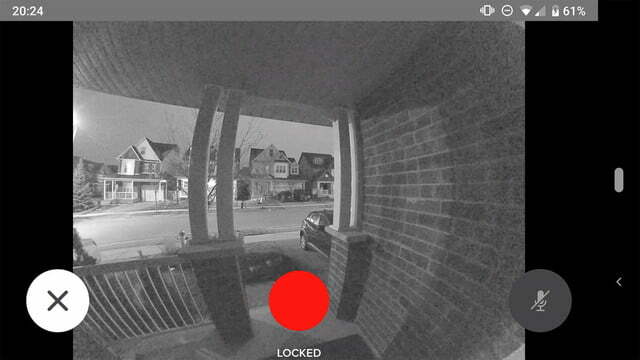 The wired August Doorbell Cam and Doorbell Cam Pro proved themselves to be decent dingers, although we found their square dimensions limited installation flexibility, while spotty Wi-Fi connectivity impaired performance. The August View, however, is different. Read on to find out what we mean. 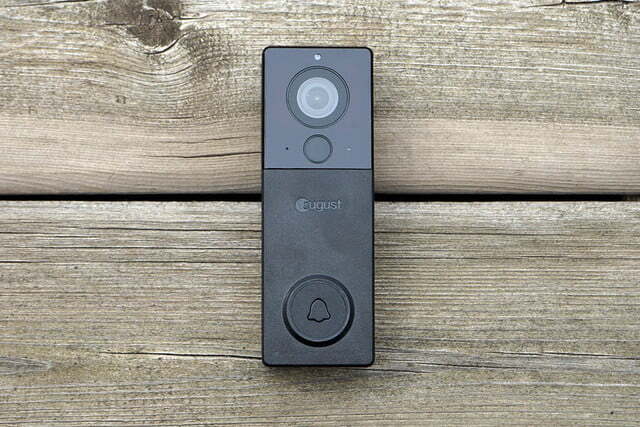 August View sees the company re-imaging their smart doorbell design with a focus on simplicity. Forget the complexity of hooking up this device to a wired chime in your home – this battery-powered, rechargeable doorbell can be installed with ease, with a discrete plug-in chime accessory that ensures you won’t miss a caller. August View is also blessed with a more regular, rectangular shape (46 x 132 x 28mm / 1.8” x 5.2” x 1.3″), which just about fits on a standard front door frame but is equally happy in other locations on the porch. 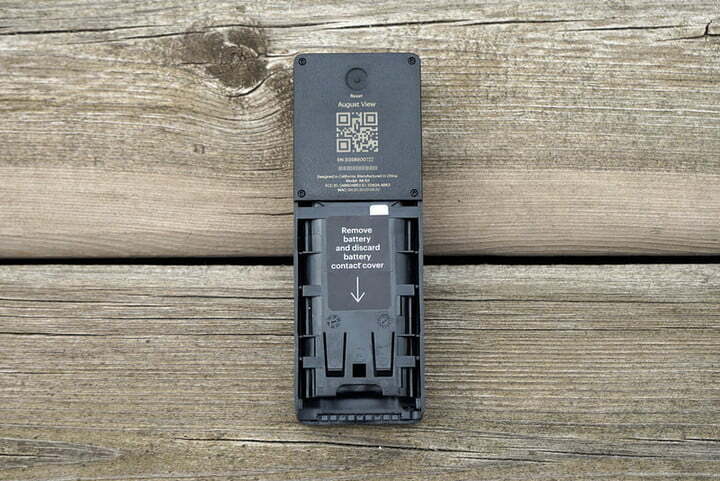 The addition of the battery pack adds considerable depth to the device, so while it looks reasonably slim face-on, it sticks out further than a wired bell. One aspect of previous August doorbells we really liked was their high-quality, metallic front plates, which despite their awkward shape, added a stylish swagger to what is a functional door accessory. So we were disappointed to see August choose a dark, all-plastic construction for their new model. It’s certainly robust, but gives the doorbell a dowdy aesthetic, which can look heavy and ponderous against pristine white or bright paint. However, in terms of build quality, it’s a step up from the cheap plastics we encountered on the $199 Ring Video Doorbell 2. An IPX5 weather rating ensures the August View won’t suffer in the elements – operating temperatures between –4 F and 122 F (20C to +50C) will keep the bell ringing in all but the harshest conditions. This battery-powered, rechargeable doorbell can be installed with ease. For extra style points, you can accessorize August View with interchangeable faceplates, available from the company’s online store. A generous selection includes four metal ($30 each) and four colored plastic finishes ($15 each), to match your home decor. 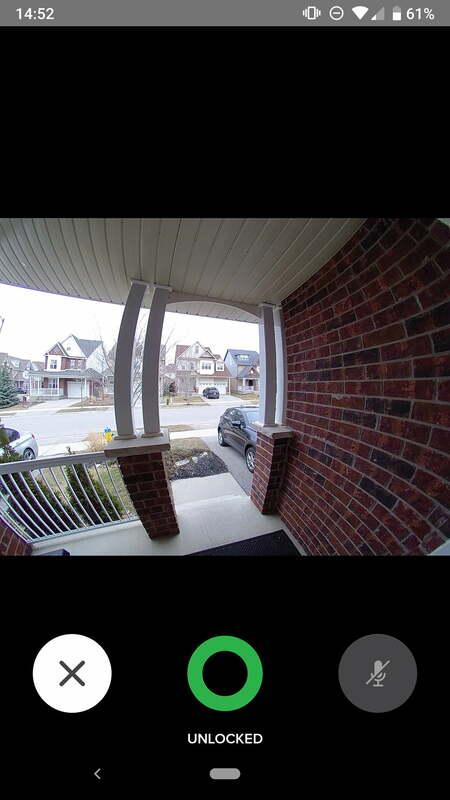 Under the hood, the doorbell’s “best-in-class” image sensor (according to the manufacturer) delivers an impressive 1440p display resolution – promising clear views of callers, or your local porch pirate doing their rounds. An integrated passive infrared sensor ensures sensitive motion detection without the usual false alarms experienced with image-based technology. Two-way audio allows you to converse with visitors remotely using your smartphone and, as you’d expect, August View integrates neatly with the company’s smart locks should you wish to allow entry. We’ve noted in previous reviews that August is a master of smart home user experience when it comes to installation, and August View continues that fine tradition. Installation is impressively easy. A (rather flimsy) plastic back plate fixes to your door frame or wall, courtesy of two screws and optional anchors supplied in the box. An included plastic wedge allows you to angle the bell’s position for the best view of your doorstep. August View then simply slides on to the back plate. A turn of a small security screw on the base of the back plate and your hardware installation is done. Should you need to recharge the doorbell’s 3.6 V lithium-ion battery at any point, that’s also a simple job. Lift off the bell, press a button on its rear, and the battery pack slides out. A micro-USB cable is included for easy charging. 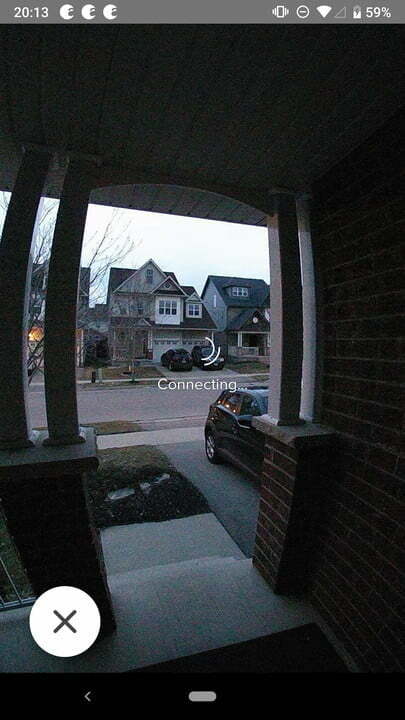 We particularly liked that the August app automatically detects the doorbell on your network. Connecting August View to your home network is similarly straightforward, with comprehensive, illustrated in-app guidance provided throughout. We particularly liked that the August app automatically detects the doorbell on your network – there’s no need to scan barcodes or work through complex Bluetooth pairing instructions. Your final step is to install and connect the August Chime module. 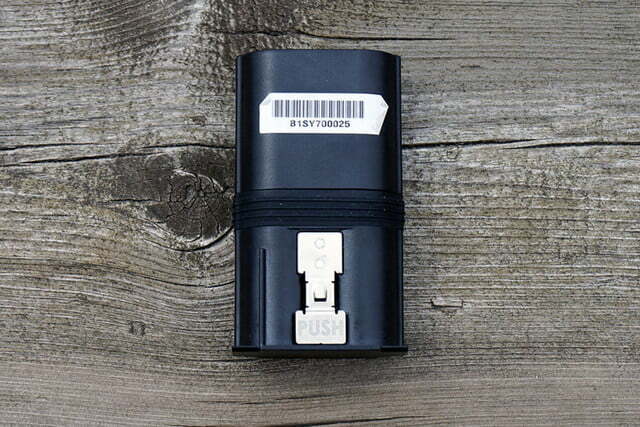 This conveniently plugs into any available electrical outlet, with a range of 100 feet from the doorbell – generous enough for even large abodes. Again, pairing is simple and quick. Once installed, you’ll have fun exploring the features of your new doorbell. Press the button, hear a chime, receive a notification on your smartphone, and open up the app for a live video stream and conversation with a caller. With an August smart lock installed (and available August Connect Wi-Fi bridge) you can even unlock the door remotely for trusted guests. Convenient? Smart? Certainly. 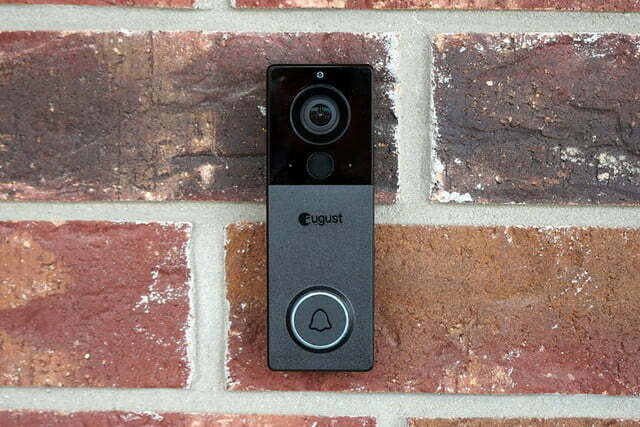 But, while August View clearly offers a leap in functionality compared to traditional, dumb door-dingers, there’s little here that pushes the state of the art of the smart doorbell. Where market-leading devices like the similarly-priced Nest Hello offer genuinely useful advances like facial recognition and pre-recorded responses for callers, at launch, August View’s feature set looks a little plain, and we found execution to be less than perfect. That 1440p video resolution is certainly crisp, if a little coarse, but we were surprised to see heavy fish-eye distortion employed to achieve a wide field of view. 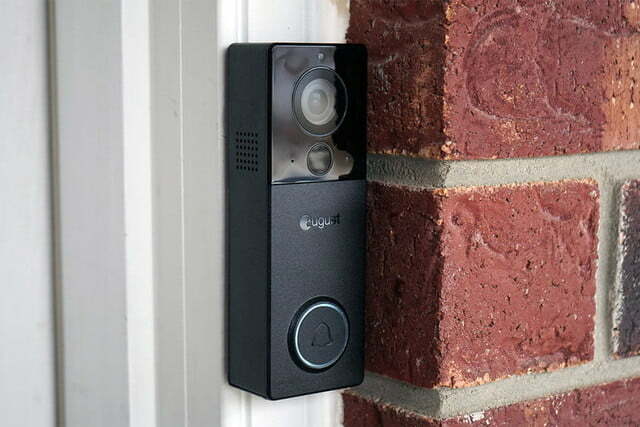 Most smart doorbells and outdoor cameras employ the effect to some degree, but it’s very noticeable on August View. We also found that the camera struggled with some environments, such as light gray skies. Our test images were overexposed in part, with areas of white houses in front of light skies lacking contrast and detail. Night time images were mostly clear – certainly good enough to recognize callers — but suffered from low light noise in some areas, which surprised us. In use, we also experienced some intermittent issues that would suggest August View’s firmware needs a little refinement. For example, at times, we noticed a considerable delay between pressing the doorbell button and hearing the bell sound – both on the device itself and the August Chime module. We didn’t encounter these issues on every test, but certainly enough to dent our confidence. 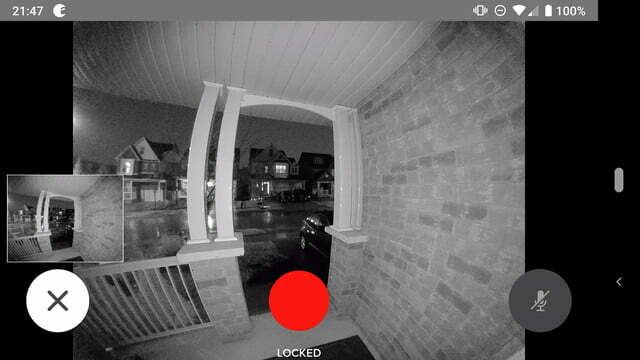 Other times, the app complained of being unable to connect to the doorbell (despite reporting a strong Wi-Fi signal) or took several seconds to wake up the device before displaying live video. And while two-way audio was mostly crisp, clear and loud enough to hold a conversation with callers, we did encounter echoes on our smartphone on occasion where the doorbell’s microphone failed to filter audio from its speaker. 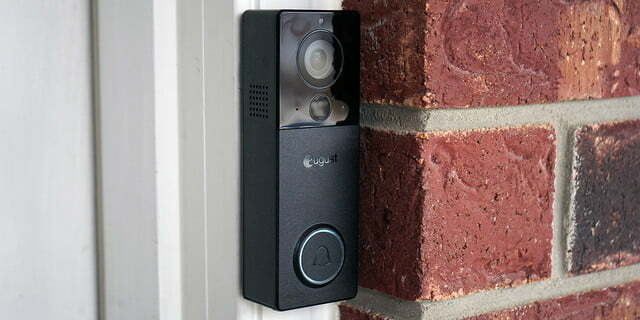 We didn’t encounter these issues on every test, but certainly enough to dent our confidence in the doorbell’s quality. Fingers crossed, they’ll be resolved over time with future firmware updates. On the plus side, we found August View’s smart lock integration to work really well. 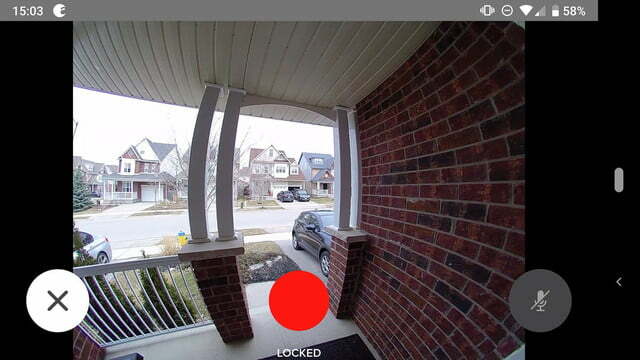 A round button displayed on the doorbell’s live video allows easy unlocking of the door for trusted parcel drop offs or to allow access to friends and neighbors. And, once you’ve covered those basic features, you can tweak a swathe of settings to refine your experience, adjusting notification settings, motion sensitivity, chime volume and melodies, video streaming quality, and more. Add the provision of caller and motion alerts via Amazon Alexa and Google smart home assistants and you have a robust suite of features that certainly transform a traditional doorway. But in a highly competitive marketplace and from a company like August, we expected to see them delivered with more reliability and polish. Despite its premium price, August does encourage an additional subscription to take advantage of its full suite of supporting services. 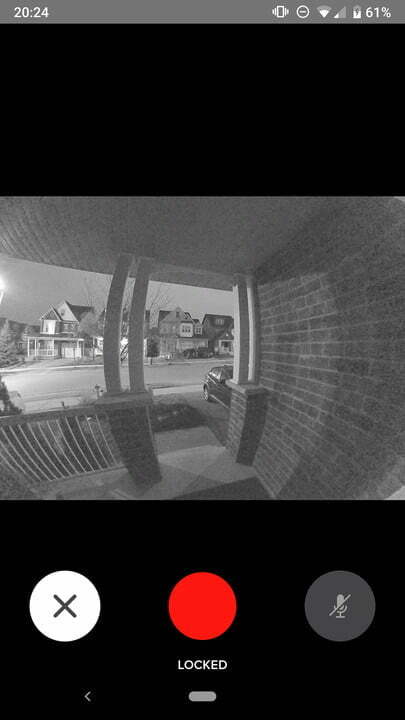 Out of the box, a free “Basic” service tier offers 24-hours recorded video clip storage, short clips of all activity capture by the doorbell, theft protection if it’s ever stolen, and the ability to download and share saved videos. A $3 “Premium” or $4 monthly “Premium Plus” subscription supports full-length recorded video clips and a choice of 15 or 30-days cloud storage. August View is protected by a one-year limited warranty. Following their acquisition by Yale, we eagerly awaited August’s next step in smart home security. While August View is certainly a decent smart doorbell that’s super simple to install and use, we were anticipating a device with a little more style, a little more quality and a little more innovation – because that’s how August built its brand. 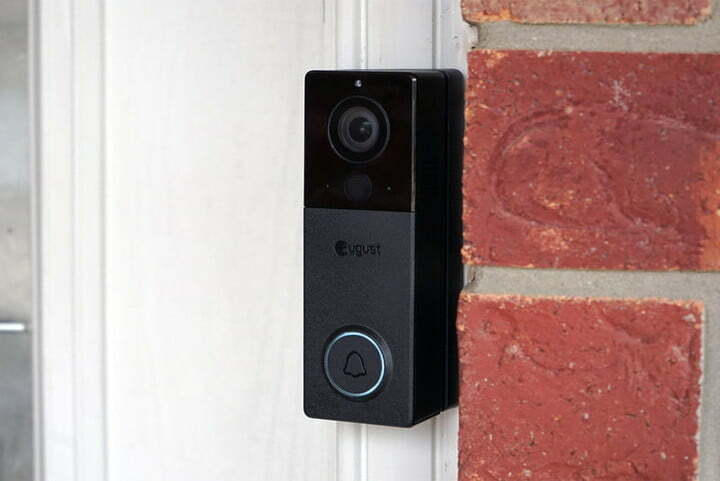 $230 is a lot to spend on a doorbell, and is more than wireless competitors like Ring and others charge. Do bear in mind, however, that August includes their chime accessory in-box, while Ring sells a similar device as an accessory. While August View matches those devices on convenience and is definitely a step up in quality, it lacks the style and smart sophistication of leading contenders like the wired Nest Hello. But, there’s certainly enough here for us to recommend August View to homeowners seeking a smart, colorful, and simple way to upgrade their front doors – particularly if the company can address the connectivity issues we experienced with this device. If you’re seeking the smartest, sleekest doorbell on the market today, wired models remain the devices to beat. The $199 Ring Video Doorbell 2 offers a slightly cheaper option for bargain hunters, but lacks some of August’s build quality. You’ll also have to invest in Ring’s plug-in chime accessory to hear the doorbell around the home. If you wish to replace a wired doorbell, the $229 Nest Hello is smarter and sleeker, but is a trickier install. With a strong focus on customer support and now backed by one of the world’s largest security brands, we have no concerns about August View’s durability. A high-quality (if plastic) assembly, IPX5 weatherproof rating, and wide operating temperature range should ensure this doorbell is fit to last. If you value simplicity over style when it comes to smart home device installation, the wireless August View is a good choice. It delivers all of the basic features you’d expect from a smart doorbell with bonus integrations for August smart lock owners.